Food safety is an issue that is fresh on a consumer's mind now more than ever. Everyone wants to be sure that what they are purchasing is fresh and safe for their family. Since beginning operation in 1928, Sunny Slope Farms has been dedicated to providing the safest produce for its customers. Sunny Slope has been closely involved with Rutgers Cooperative Extension Service for over 50 years, working together to develop the best ways to grow produce. Sunny Slope was one of the first farms to participate with Rutgers' onsite research programs to see what techniques work best for protecting the peaches from pests and having them grow to their fullest potential. Rutgers has been a leader in New Jersey as well as other parts of the nation with Integrated Crop Management (ICM), which incorporates natural pest control techniques that reduce the use of pesticides and insecticides. Currently, new techniques being explored include experimenting with the use of pheromones to protect against insect problems. Sunny Slope has been dedicated to maintaining good handling practices since the beginning. Last year the farm participated in a voluntary Third Party Audit Program through the United States Department of Agriculture (USDA), regarding good agriculture practices and good handling processes. 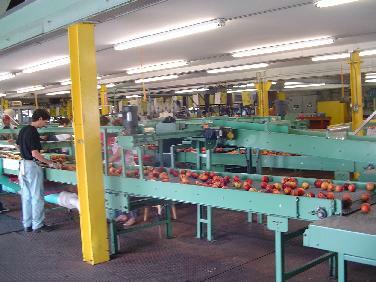 Another measure that Sunny Slope made for the safety and benefit of its customers was to begin pasteurizing their custom-blended apple cider. Sunny Slope always tries to put the fruit first because they know that they are feeding families just like their own.